The Blurb: Over the decades, Richard Matheson's 1954 novel I Am Legend has spawned a series of iconic horror and science-fiction films, including The Last Man on Earth (1964) starring Vincent Price, The Omega Man (1971) featuring Charlton Heston, and I Am Legend (2007) with Will Smith. Its compelling narrative about the last man on earth struggling to survive a pandemic that has transformed the rest of humanity into monsters has arguably become an American myth. While its core story remains intact, filmmakers have transformed its details over time, their often mixed messages reflecting changing attitudes about race and masculinity in the United States. This reexamination of Matheson's original novel situates its tale of a man's conflicted attitude about killing racialized others within its post-World War II context, engaging the question of post-traumatic stress disorder. It then analyzes in turn the novel's several film adaptations, focusing in particular on producers' choice of actor to bring to life Robert Neville, the last man on earth. Released respectively during the Cold War and the Civil Rights Movement, the Vietnam War, and then much later in the post-9/11 era, these films reveal America's ongoing struggle with racial conflict and the construction of masculinity. 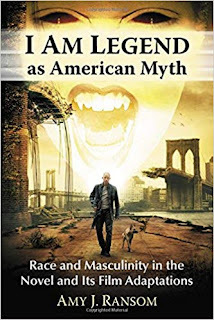 The review: If you look to the sidebar of the blog you’ll see I list 5 novels as “primary classic literature” and only one is from the 20th century – Richard Matheson’s I am Legend. There is a reason for that; Matheson’s novel impacted the genre in a massive way, it created its own genre (it is arguable that the modern zombie film owes its genesis to the novel) and it is a damn fine book in and of its own right. This is an academic book that looks at the novel through the lens of American myth and the way it (and the subsequent films) treated the subjects of race and gender (in particular). It is an insightful read and worthwhile. It uses some media studies theories that a more casual reader might not be familiar with – but explains the theories and their use – so be it adaption theory or star theory, the reader will not be lost. As well as the primary three films (the book has four main chapters looking at the novel and then its three primary adaptations in turn) the book also touched on the budget zombie flick I am Omega. I suspect it is entirely reasonable that the book ignored I am Virgin. On the other hand, I would have thought that (whilst not an adaptation) touching on the Star Trek episode Miri (1966) would have been salient when discussing the later Omega Man – as the change to the disease would seem to be a partial adaptation from that (in that there are group of infected children who are not ill but the illness sparks in adolescents/young adults). I was somewhat confused with the assertion that the Will Smith vehicle only uses religion “tangentially”, especially when the narrative then goes on to list the way it is front and centre (the butterfly symbology is in place from the first scene and the entire plague would seem to be God’s plan, with Neville as the saviour. This takes the Christ aspect from the previous two films to a whole new level). But that was a brief moment where I think the author missed a point and generally I enjoyed her arguments and reasoning. 8 out of 10.